Where it all began: Shireen with her family at the exact location where she won her first roller skating competition. The transformative moment when Shireen realised her ‘competitive’ spirit. 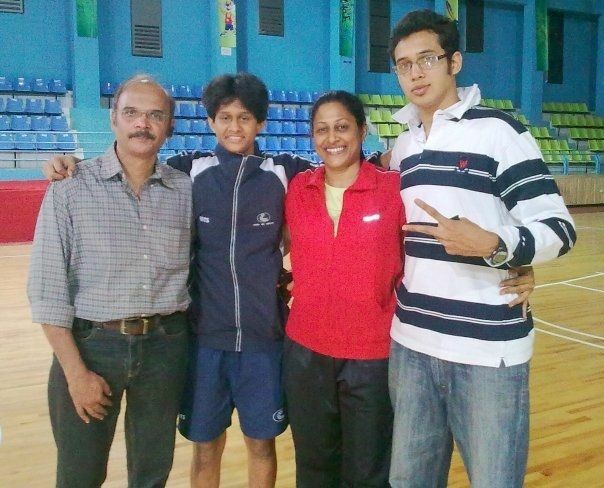 The same venue in Pune would fortuitously turn out to host her first international basketball appearance in the future. For me, it was all about good genes and nurture. My parents have represented three sports at the national level between them, namely, swimming, basketball and netball, apart from playing other sports for the city and their district. I have an elder brother who is also good at quite a few sports. In other words excellence in sports is coded into my DNA. If it were not for my family, I would have never been so successful in basketball or any other activities that I do for that matter. My earliest taste of sports was when, at the age of three, my parents took me for my first swim. The thought of sports as a career couldn’t have dawned on me or my parents, since I was too young. My parents introduced me to various activities such as roller skating and swimming at a very early age. Now I know the reason behind this, which was to ensure my physical growth and mental conditioning, speed, balance, endurance, adaptability and fine motor skills. After swimming, the sport which caught my fancy was roller skating. Roller skating was a completely new feeling and helped me realize that the only thing that limits one’s capability is oneself. Reminiscing about the past, it brings back all the early morning road skating, falling 2 times a day (something that cracks me up even today!) and bruises on the knees. I enjoyed every bit of it. I’d taken part in many races and there was on which is the most memorable. I was in Goa for a family holiday and my mother got a call that there was a state championship race the next day, so we rushed back home to Pune and got geared up. Back then, pre-race match jitters were much more than today and I was all pumped for the race. The next day when the race started, I tripped off one of my competitor’s foot and fell badly. As I fell and everybody went ahead of me all I was saying to myself was “get up Shireen, forget the pain, get back into it, it’s just a matter of time.” When I got back into the race I was already overlapped and had a lot of racing ahead of me if I wanted to be on the podium. 20 minutes later when the dust settled I was standing on the finish line looking back at the second place finisher, having won the title. That day me and my family saw the fire and the killer instinct every sportsperson should have. Ever since I can remember, my mother has always had a deep connection with basketball. Even when I was the best skater of Maharashtra U-6, my mother could not make it to my practice sessions. She used to come to pick me up after I was done with practice. Sometimes on the way back to Poona Young Cricketers (PYC) gymkhana where my mother coaches, I used to skate on the road alongside my mom on a scooter. When she used to coach and play I would go and shoot some hoops on the short ring. Even on the court I would skate sometimes and trouble the seniors! My naiveté’ made me discontinue my skating career. I couldn’t handle seeing my friends’ parents coming to see their children skate. Since I wanted to spend more time with my mother, I decided to take up basketball as it interested me anyway. Hi what about netball.I know the administrators are killing it but would have liked if u mentioned about netball as u were the youngest and a very good player at commonwealth games 2010.